I am a native English speaking attorney with 14 years of experience. I am licensed to practice in Israel (2002) and New York State (2006). My main fields of practice include: Real-estate, civil and commercial litigation, wills/estates/probates, trademarks – Israel and US, commercial law, and notary services. I have taken care of and administered many estates with assets in Israel, the US and other countries and other multipart probate matters. Over the years I have also handled many complex real-estate transactions in Israel for all types of properties - private and commercial. 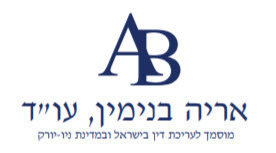 I have many years of experience litigating civil, commercial and IP matters in all instances of the Israeli legal system, including the Supreme Court, in arbitrations and mediations. As a commercial lawyer I have advised on transactions valued at millions of dollars in Israel and abroad. I represent many firms and private persons – among them many Americans – and would be happy to assist you as well.